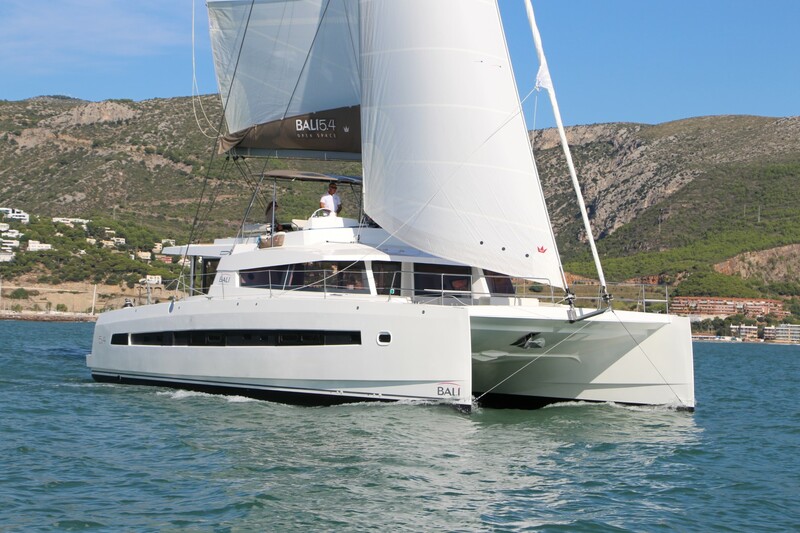 After face-lifting and integration of the latest innovative solutions by naval architects from renowned VPLP inherited from the bigger sisters, the new generation of Lagoon catamarans was born. Lagoon 39 is one foot longer than the previous version, Lagoon 380. 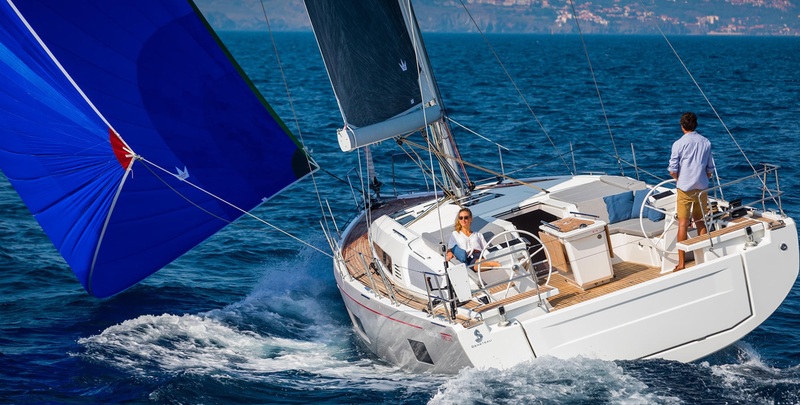 Lagoon 39 has vertical bows, it has a hardtop seemingly levitating above the cockpit while skipper’s commanding bridge is moved to starboard, in the middle layer between the cockpit and the mainsail. The mast seems to be pushed to the aft so the jib became larger and equipped with the self-tacking system. All sailing commands and trimming systems are positioned close to skipper’s hands while there is some space under jib-sheet for sunbathing, especially when sailing with a gennaker. The cockpit has lost its dining table, but the space is used for designing a decent lounge area. The saloon also has a brand new face, abounding with a lot of space and natural light coming through vertical windows all around the saloon, providing 360° visibility. The interior design by Nauta Design amazes with its distinguishing handwriting with emphasized ergonomic, elegance and simplicity. There is a useful, square-shaped dining table in the saloon center and to starboard, while the galley and the chart table are positioned to port. Lagoon 39 comes in several interior layout options – 2, 3, or 4 double cabins to accommodate up to 8 people very comfortably. It is available with large owner’s cabins in each hull, providing a spacious double bedroom, a desk and separate bathroom. Besides double beds, guestrooms abound with plenty of storage space along with hanging lockers. Although it is a very comfortable catamaran it is a small yacht after all. Therefore one should be satisfied with 2 x 200 l of fuel tanks capacity and 2 x 300 l water tanks capacity. The total sailing area close hauled amounts to 76 m2, while standard engine equipment considers 2 x 21 HP engines. Aside from all advantages stated above, this little star has some disadvantages. Since there is no standard roofing system for the skipper, he or she is exposed to sun and sea spray. Furthermore, skipper’s cabin, if constructed, can only be very small since it is a 40 feet long yacht. The last remark is regarding the standard engines. Regardless the fact it is a small yacht, you should be aware that rather weak engines need more time to respond in case of side wind when maneuvering. 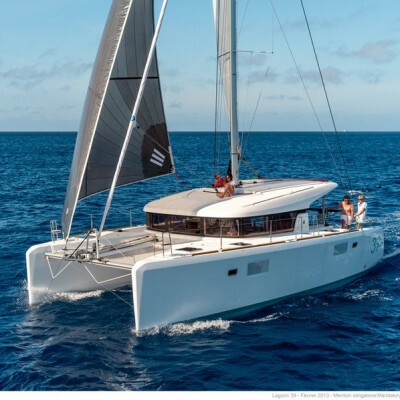 To learn more about catamarans and their feature, types and sizes and top destinations for a charter catamaran, visit Sailing Catamaran Yachts.